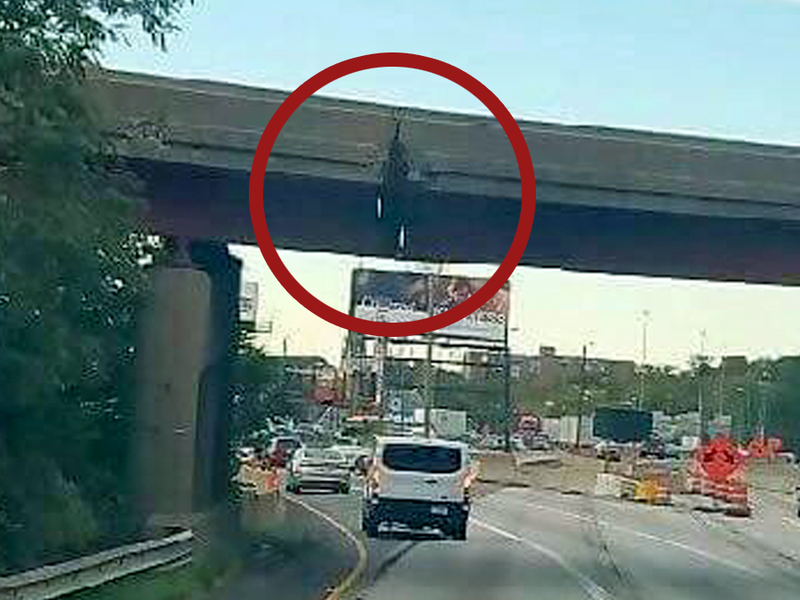 CINCINNATI -- Laurie Brickner has a front-row seat to the ongoing drama that surrounds the Western Hills Viaduct. "I don't think it's any secret that it's not in good shape," she told WCPO. "When I'm underneath the viaduct every morning to go Downtown, I'm a little concerned. It looks dilapidated, like it's in desperate need of repair. "I can't wait to get to that highway so I know nothing's going to fall down on me... Very scary." Brickner makes the daily commute from her home in Western Hills into Downtown, where she works at the Hamilton County Justice Center. "I think it should be on the forefront of the city's projects to get fixed," she said. The 85-year-old bridge has become a symbol of the region's growing infrastructure needs, particularly within the last year, after an image of a crack in the bridge's concrete barrier went viral online. Emergency crews had to close the bridge's lower deck months later after a chunk of concrete fell and struck a moving vehicle. The bridge doesn't just symbolize the state of many of the region's roads and bridges. It also has come to show just how complex it is to fund and launch massive infrastructure projects like the viaduct. Other projects, like the Brent Spence Bridge replacement, also linger in limbo. This reality came into sharp focus as regional leaders recently approved plans to improve roadways and construct a new parking garage near the site for a proposed FC Cincinnati soccer stadium last month. Some, like Brickner, were taken by surprise at how quickly officials seemed to find the money to approve those plans. Brickner said it has her wondering, "What about us?" It turns out there's a lot more at work behind the scenes than most realize. Despite public perception, the reality is that most of the money offered up by the city and the county for road improvements and a new parking garage could not have gone toward a new viaduct, or any of the other major transportation infrastructure projects facing the region. The city, which pledged roughly $37 million for road improvements and utility work near Oakley Station -- the proposed location for the stadium -- found the money from various sources, including through what's referred to as tax increment financing, or a TIF. That's basically funding a project through taxes collected over time from businesses in the vicinity of a new, major development or re-development project. That means TIFs are usually attached to a specific project or area. In this case, the city used TIF money attached to the Oakley neighborhood specifically, among other smaller grants. As for the county, it's a similar case, with much of the money coming primarily from parking revenue. The county's contribution will go toward a $15 million, 1,000-space parking garage. Funding for projects like the viaduct has to come from other sources, according to Hamilton County Commissioner Todd Portune. Portune will be the first to identify the Western Hills Viaduct as the region's "number one transportation priority." "We're looking to find every specific dollar that we can add to the project," Portune told WCPO. "That's both from the private sector as well as public grants and federal local-share money." Portune said the county has already found $33 million of county money for the estimated $330 million fix, and the Board of Commissioners last month approved charging automobile owners an additional $5 on their annual license registration fee. A large portion of that money will go toward the county's share of the viaduct project. In turn, Cincinnati Mayor John Cranley announced Thursday that the city will pledge an additional $33 million toward a new viaduct, although he is still waiting on specifics from the city's financial advisors on what specifically that will look like. 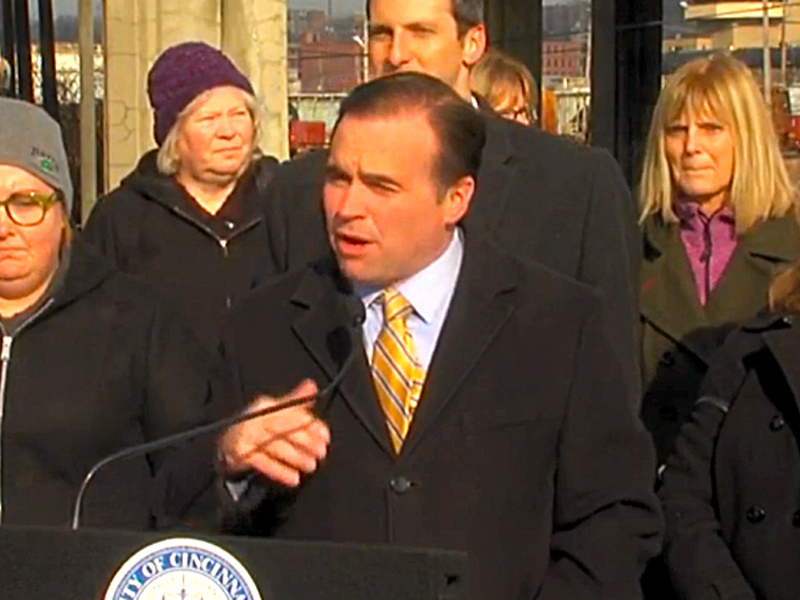 "I grew up driving this bridge, and it has to be replaced," Cranley told reporters. He delivered the news alongside several fellow council members, county commissioners, and West Side community members. Something else that set the stadium proposal apart from other infrastructure projects is that it's tied to more than $200 million in private investment, Portune said, referring to a group of donors who offered to completely finance the stadium construction. "It's not often that we have private party contributions exceeding $200 million available for a new development project," he said. "So we wanted to be helpful if we could. We found a way that we could do that without embroiling any county tax dollars in the project or otherwise upend any other major projects." With any infrastructure project -- whether it's a new bridge or widening a two-lane road -- the number of steps involved can be overwhelming to anyone not trained in civil engineering or planning. Beyond just finding the money for these multimillion-dollar projects, a large part of the battle is coordinating all the players. "Lots of meetings, lots of discussions. We want to make sure everyone's on the same page," said Matt Bruning, a spokesman for the Ohio Department of Transportation. "At the end of the day, we want to make sure the majority and the folks that use it are happy with that end result." Public hearings are a critical part of this process, and in most cases are required by law, Bruning said. "It's important to note that in almost every case, there is a requirement to get public input," he said. That's because infrastructure projects never come without some impact on the surrounding environment. "That's not just the environment like rivers, trees, streams, but also the impact on the community," he said. "We're required to have public meetings. "As much as it is us talking and telling a story, it's us listening and hearing what they think." For Portune, the public input is the most important part of the process. "It's got to be open. You have to have a dialogue with the public," he said. "You can't rush these things." Beyond reaching out to the public, infrastructure projects often involve coordinating the efforts of multiple government agencies across jurisdictions. The Western Hills Viaduct involves the city, the county and the state, which last year awarded the project $10 million to develop the new bridge's design. It will also require a hefty sum in grant money from the state and federal governments. Local officials expect they will need to cover about 20 percent of the total cost for a new bridge, with state and federal agencies covering the rest. "The real challenge (with the viaduct) is going to be getting the money out of the state and the feds," Cranley told WCPO following Thursday's news conference. "Sixty-six million dollars is a steep local match, but we're here to say we've got it, and that's going to move us up in the line of projects throughout the state. "In order to advance in that line, you've got to have the local match in place." Private partners sometimes play a role, too. Like with the stadium deal, leaders have engaged the railroad companies that use the tracks running underneath the viaduct, Portune said. "They're going to benefit greatly from the new bridge," he said. Bruning said much of the work his department does is not exactly conspicuous, either. "A lot of what we're doing is to preserve what we already have," he said. "We're not building a ton of new infrastructure. Where we need to, we will, but the main focus has been on preservation." Bruning estimates roughly 90 percent of ODOT's budget goes to preservation of existing roads and bridges. Because so many pieces have to lock step for projects like these, their timeframe can be difficult to comprehend from the outside. Bruning said his department plans its projects as far as six years ahead of time. That's in order to head off problems before they become critical and to accommodate the massive coordination these types of projects require. Kentucky's Transportation Cabinet has a similar timetable. City planners are working on a 10-year timeline for funding and building a new viaduct. Commuters' day-to-day struggles with the existing bridge can make that timeline hard to get, and it's had some people like Brickner feel they're neighborhoods are being left behind. But Cranley and Portune remain confident they are getting things done with what they both refer to as the region's number one transportation priority. "I can't speak for anyone else, but we have made sure that there's nothing getting in the way of the county fulfilling its end on making sure the Western Hills Viaduct gets done," he said. "This project has been a key priority from the county, and we have acted swiftly on it." Cranley had a similar message this week: "(This is) a project that is near and dear to all of our hearts... It absolutely must happen," he said. "It is the lifeblood of the West Side." After the city and county's recent announcements, Brickner said she's feeling more encouraged than in previous months. When asked if she still feels the West Side is being left behind, she said, "I don't necessarily feel that way now. The money has to come from somewhere. "Hopefully that's a step in the right direction."